Update 6/18 -- Annie is back home safe and sound! 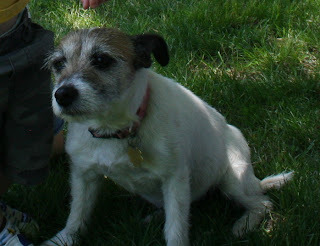 Have you seen a little Jack Russell out wandering around on her own? Annie left her yard on Yorkshire Drive in Dover on Saturday, June 13th, shortly after having a bath, so she is wearing no collar or ID. Her owner is frantically looking for her, so we are trying to spread the word. Please call the Medfield Animal Shelter: (508) 359-8989 if you have seen her.